Customers can avail from us a remarkable range of Operation Theater Equipment. 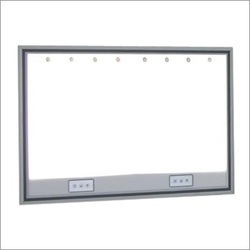 Under this range, we includes quality-assured X-Ray View Box, Hatch & Pass Box, Surgeon Control Panel, Magnetic Board and Pressure Relief Damper. These products are manufactured in tandem with the international quality standard using high grade raw material and latest technology. 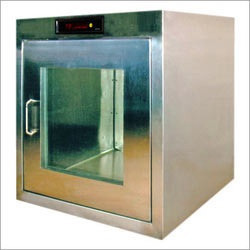 The offered range of products is also available in different specifications as per the customers requirements. Our organization is counted among the reliable firms offering X-Ray View Box. These products are used in modern operating theaters so as to ease operating staff during operation stage. Our range complies with international standards and are built using high efficiency electronic regulating ballast with dimming PCB to control the light dimming while maintaining a flicker free viewing effect. J K X-Ray Viewer is low power consumption to provide a homogeneous imaging effect. It is a shadow free design and dissipates very low energy and heat and it is suitable to be used for long hour operation. The viewer is available in single & double plates construction as standard product for operating theater while J K could offer many other range of viewers to suit different applications and environment. The body is built by using electrolyzed steel epoxy powder coated to BS standard and using High quality white opaque acrylic sheet as diffuse mean. The electronics control is installed in lower compartment and the dimming could be adjusted by pressing the button on the fascia. J K X-Ray Viewer is fully compliant with LV requirement while the panel is built to comply with IP standards. Backed by the profound experience of the market, we are offering a commendable range of Surgeon Control Panel. The products we are offering are designed to scope with changing technology and equipment in operating environments. User friendly, high performance, smooth finishing, longer service life, ease of operating and maintaining purpose are some of its salient features. Our patrons can avail this range as per their specifications. The membrane concept system consists of tile formats which when used with the range of J K PCB's. The fascia is made of superior quality UV resistance membrane with sterilizer feature. The membrane backing is made of 2.5mm thick aluminum that is rust resistance. 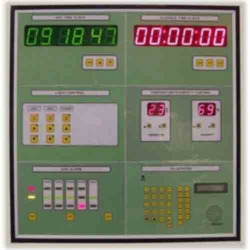 All high voltage equipment is installed in a separate enclosure. Customer could select own text to be inserted into the fascia for ease of identification at own conveniences. Standard color offered is RAL 9002 for the frame & membrane fascia. 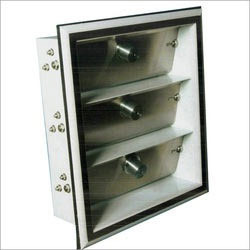 In order to meet the distinguish requirements of the clients, we offer a range of Hatch & Pass Box. Easy to install and maintenance free, these products comes along with higher quality finish, which is highly demanded by the clients. We also provide all the selection criteria and act as a solution provider to its customers. Our offered range is tested to match the actual operating conditions and are highly acclaimed by the patrons. A hatch will be provided in each operation theater to remove Waste material from the operation theater to dirty linen area just adjacent to operation theater. Each hatch will be equipped with two doors and the door will be operated electronically. The hatch will be designed in such a way that only one door will be opened at one time. The UV light will be so installed that it is kept on while both the doors are closed, this UV light has to be automatically turned 'off in case of opening of either of the doors. There shall be indicators on both sides of the OT so that door open /close status can be monitored from both ends. 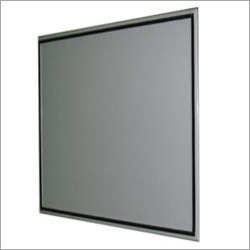 Our organization is engaged in offering a high performing array of Magnetic Board. Developed in compliance with the international quality norms and standard, these products are manufactured by making use of latest technologies and superior quality raw material, procured from the most authentic vendors of the market. Our organization is counted among the reliable firms offering Pressure Relief Damper to our valuable customers. The offered range is manufactured using best quality material and available technology following international industry standards of quality. Developed with extreme perfection to assure that these are the best stabilizers available in the market. Highly acclaimed by different industry experts, these products are appreciated by the clients. Suitably sized air pressure relief damper will be strategically placed, enabling differential room pressure to be maintained and ensure that when doors are opened between clean and dirty areas. Allied PRD has first class electrolyzed steel plate for body and high grade Ss304 stainless steel blades, which pivot upon sealed for life time maintenance free bearing assemblies.